A federal lawsuit filed this week on behalf of Y-12 retirees claims that their health care benefits were dramatically reduced by a new contractor, violating promises made to them when they retired from the federal facility in Oak Ridge. “The plaintiffs … were defrauded by being led to believe that their employment agreements provided them with a specific level of benefits,” the lawsuit filed in U.S. District Court in Knoxville states. 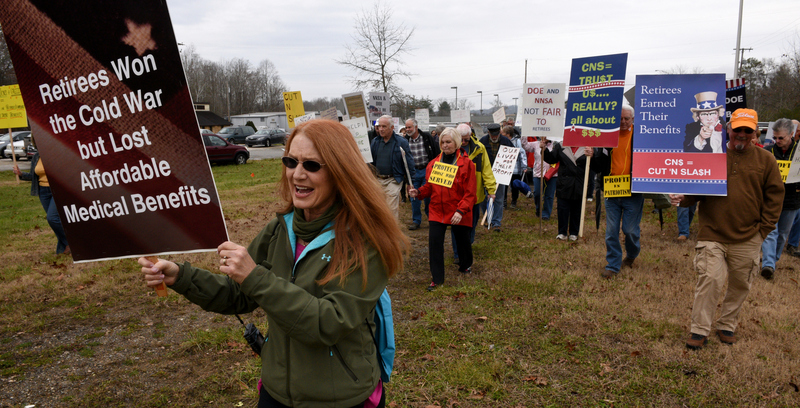 The suit was filed by attorney Greg Coleman on behalf of retired Y-12 employees Betty Hatmaker and Charlene Edwards — two of the organizers of rallies last year in Oak Ridge to protest the change in benefits implemented by Consolidated Nuclear Security. The lawsuit also seeks class-action status to represent thousands of other retirees and spouses. CNS took over management of Y-12 in mid-2014, replacing Babcock & Wilcox Technical Services as the contractor at the Y-12 nuclear weapons plant in Oak Ridge and Pantex, a sister plant in Texas. According to the lawsuit, employees at Y-12 were misled or misinformed about the value of their benefits and, after the benefits program was changed by CNS, the retirees encountered higher costs and reduced health care benefits as a result. The lawsuit says that some employees opted for early-retirement programs with the understanding that they would continue to receive the same health benefits “for the entire duration” off their retirement. Had they known otherwise, some employees would not have chosen to retire at that time, the suit states. “On January 1, 2015, CNS made several changes to the health care and welfare benefits of the plaintiffs and the classes which significantly altered the cost, coverage and value of their health care benefits,” the lawsuit states. The legal complaint is seeking to either restore their benefits to the level that preceded the CNS changes or to be reimbursed for the value of the out-of-pocket costs endured by the plaintiffs and the reduction in benefits. Jason Bohne, the communications director for CNS, said the contractor had not yet received a copy of the federal lawsuit and had no comment. This entry was posted in CNS, NNSA, Y-12 on August 13, 2015 by Frank Munger.